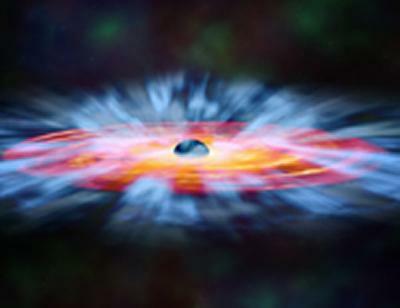 Working as part of an international team, astronomers at the University of Southampton have revealed some striking features in the gases emitted from the regions close to one of the brightest, supermassive black holes known to man. The results are published in the latest issue of Astronomy and Astrophysics journal. The team, led by Dr Jelle Kaastra from the SRON Netherlands Institute for Space Research, observed and mapped the environment around this 'monster' black hole, which is in the distant galaxy Markarian 509 and has a mass 300 million times that of the sun. The researchers found a very hot 'convertor' corona hovering above the black hole and cold gas 'bullets' in hotter diffuse gas, speeding outwards with velocities up to 700 km/s. The international consortium responsible for this campaign consists of 26 astronomers from 21 institutes on four continents. The first results of this campaign will be published in a series of seven papers in Astronomy and Astrophysics. More results are in preparation.